So I was all set to publish a fun little craft we did today and tie it into some books from the library, but that will have to wait. I am going to get serious and deep here, so if you don't want to go there with me you may want to skip this post. 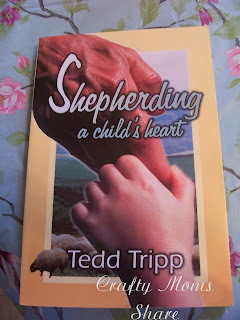 I've been reading Shepherding a Child's Heart by Tedd Tripp. I am going to apologize now, because I learned about this book on someone's blog, but apparently I did not pin it. So if it was your blog, please let me know so I can source you!! I'm only in the beginning of Chapter 4. 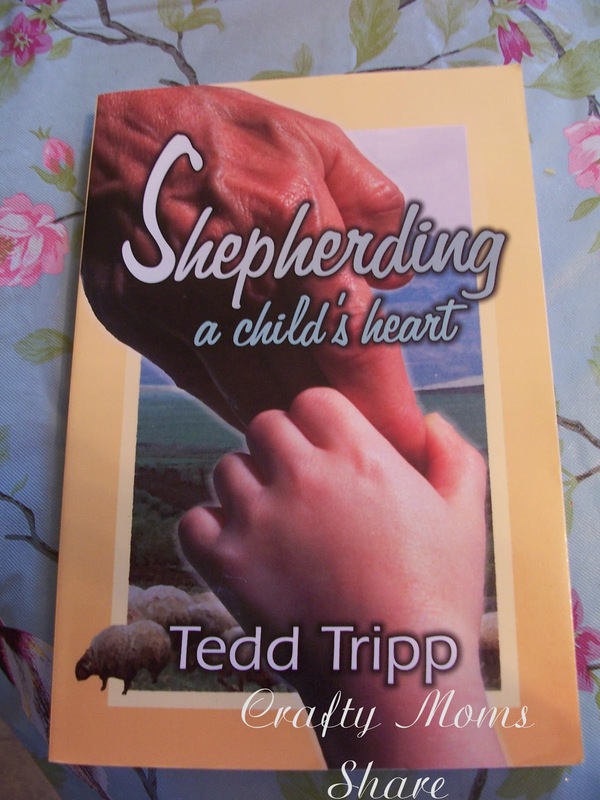 Tedd Tripp is a father and a minister (possibly retired). I have been reading a chapter here and there for a few months now. In this book, Tedd Tripp discusses how everything you need to know about parenting and discipline are in the Bible. He also says any age child should know God and show a tendency to love God or to disobey God (and be self-centered). Or at least that is what I have taken from what I have read. Now Hazel is three and a half and I have to say I do not totally agree with the knowing God or being self-centered here. One example he used was when two children fight over a toy. Most parents, teachers, etc. say the toy should go to the person who had it first, but he says actually both children are in the wrong since God wants us to treat each other as we would want to be treated so the first child should have given the other child the toy if he/she is following God. Now I don't know too many any three-year-olds willing to give up a toy they are enjoying because another child wants it without some adult intervention. I honestly do not think the child's reasoning is far enough along at that point to understand that. However I do agree with many things said in the book. Today I was beginning Chapter 4 and he gave an example of disciplining his own son (a typical conversation between them) with him telling his child he must discipline (ok, he said spank but I will not spank Hazel) because that is what God says must happen when a child does not obey his/her mother/father. While cleaning up the mess and trying to keep it from damaging anything, I explained to her that doing it on purpose was not funny or fun and for that she would need to be disciplined. I went into the whole story of that God wants me to discipline her like the book said. She was not happy with the discipline which was that I would only read one story to her this evening instead of our normal three and only told her one without a book as well which I often only tell her one and then Daddy tells her more. Yes, she was crying and upset about this, but I did not cave. I really try not to cave when she cries since her father and my mother-in-law often do. I do not want her to think she can get whatever she wants by crying. Well before she fell asleep we had a long discussion well I guess I had a long discussion about God and my beliefs. I had asked her if she had any questions about the discipline or my reason or about God. She answered yes, but asked me to tell her. She doesn't quite get what a question is all the time. So I told her I could tell her my beliefs, and she said she wanted that. Somehow, I feel awful about the whole experience. I'm not sure why, but I do. I'm hoping it is just because it has been a long, busy day. I have been trying to introduce God to her more. We do almost nightly prayers, but I'm not totally sure she gets it all. We go to church, but at church she goes to the nursery and plays with high school students (who are also her babysitters mostly) during the school year. It is only in the summer when the nursery is not open or when she goes to mass with Steve and his mother that she is in church. Oh, and the Christmas pageant when we are angels. I have found this book helpful to start introducing God to her and what being a Christian means. How have you introduced God to your child? Do you use God in your discipline? Any thoughts? Anyway, yes we talk about God all the time. We pray together as a family before meals, before bed, any time we have a concern. We go to church, and the kids go to the children's program where the Word is taught. We talk about asking Jesus for help to make good choices when we are tempted. My oldest has done AWANA for two years, and it has been a great program for him to learn Bible verses. My three year old will go in September. I am strong in my faith, and committed to sharing my beliefs with my daughters. My oldest is 3 yrs 3 mos, and has been coming to church with us since she was 6 days old! :) We used to belong to a church in Cambridge that my husband and I loved, but had no other families... introducing our daughter to God was enough of a reason for us to seek out a new church family, and we have found one we love in Brookline. She goes to Sunday School and is learning so many bible stories, songs, and important values. We talk about God, Jesus, the bible whenever it comes up, or when it seems to fit in with the conversation (which is actually quite a bit). My grandmother passed away recently, so my daughter is currently very interested in heaven... we've found some great books to read, leading us to more discussion about God. I want her to have as big a part in directing her understanding of Christianity as her parents/the church. We pray before meals and at bedtime. My goal is for her to learn the morals, and that God loves her for now. (Basically! Of course, there are always tough questions that come up when reading certain bible stories!) I grew up in a church I loved, and believe that A) believing and B)church family were such an important part of making me who I am. I want that for my daughters. We do not use God in discipline, directly, but focus more on "how would Jesus/God/the bible do this differently?" I am interested to read this book, now! Thanks for this post, it really got me thinking.... Like the PP, I could really write a book here! If you ever want to get together to let our girls talk this stuff out together (and then move on to discussing the baby cow at Drumlin farm! ), I'd be up for it :)!